The Ki ngston Middle School library ensures that all students and staff have access to information and resources that allow them to pursue life-long learning, to act with integrity, and to respect diversity. 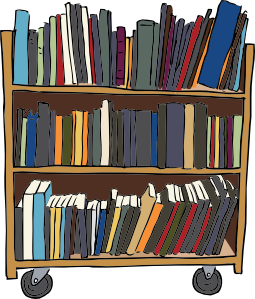 Some books in our collection, due to mature content, are kept on a separate bookshelf and require parent permission for check-out. This is also true for similar books that students may request as an inter-library loan from the high school. Books in this collection are marked in the catalog as "ASK" in front of the call number. For example, Breaking Dawn is identified as "ASK F MEY". You can use "ASK" as a subject search to find a list of these books in the catalog.